Find the right tour for you through Komombo. We've got 48 tours going to Komombo, starting from just 4 days in length, and the longest tour is 18 days. The most popular month to go is June, which has the most number of tour departures. "I had Mohammad as a guide and he was very knowledgeable. I do wish we were given..."
"Had the absolute best guide!!! 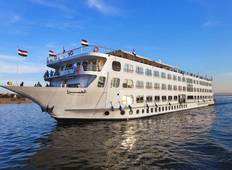 Knowledgable , caring, courteous & made the entire..."
"We just came back from our King Tut tour with On the Go, and it was a great 9 days!..." "I had a fantastic time on this tour. Sam was a great guide. He was easy to approach,..."
"It was the trip of a lifetime! Exceeded expectations! The tour guides were very professional..."
"I loved my trip visiting all of the historical sites. Nothing to dislike. 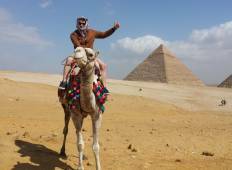 I appreciated..."
"Ahmed Kamel is literally one of the most warm and caring souls I have ever met in..."
"Me and my wife booked the treasures of Egypt tours om tour radar and look at Egypt..."
"Just a quick note to say that we had a great time in Egypt and Jordan. These are..."
"UNreal. Sam was an awesome guide, best ever. The accommodation was sweet, a lot better..."
"On the go is a fun tour company. There are both singles and couples on the tours..."
"This 9 day tour was able to include the essential historical highlights of Egypt..."
"Sam was so knowledgable about everything and was able to answer every question that..."
"This fantastic holiday takes the form of a road trip from Cairo to Luxor. Over a..."
"amazing trip - went november 2012 with a friend guides amazing scenery stunning fellucca..."